As I wrote in the post of Football Pavilion of Brazilian Embassy, Brazil Festival is held on 19 & 20 July, 2014. It is held in Yoyogi Park in Harajuku, which is also near from Shibuya. I was looking forward to visiting it! Events are held in the event space next to Yoyogi Stadium. It is across from the large Yoyogi Park. Unfortunately it was very cloudy, but the colors and atmosphere made me excited! The festival starts at 11. 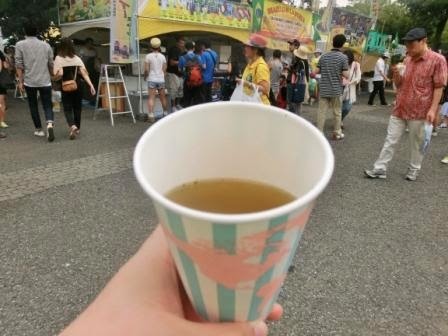 Good for lunch, so I strolled along the food & drink stands. Everyone was eating a stick and every stand had Churasco sticks. So the park was exciting with the smoke and good smell. 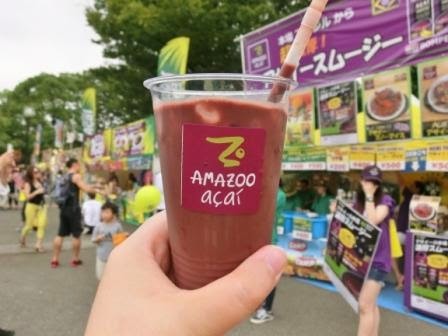 Acai is getting popular and popular in Japan now. I’ll write an Acai bowl I had in Shibuya later. You know I love eating, so I kept so, then…. The people were shouting that Brazil equals this. They said it was cocktail made from sugar canes. So I tried it…. How many alcohol percentages did it have!? My throat was burnt out with one single sip. I can’t believe that some people were walking with drinking it…. When meet a new food, it can happen. And it is one of fun experiences of cultural events. And it was a lesson for me. Next time I try an unknown drink, I’ll ask the shop crew how it tastes and how strong it is. 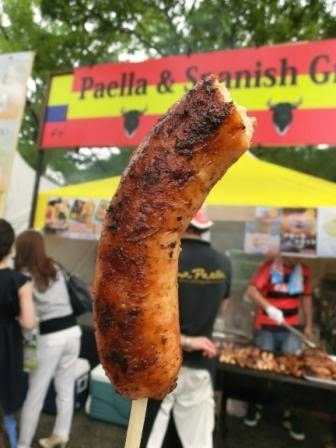 Next, a Spanish food stand. A bit spicy, and smells so good. Great! A huge pan of Paella!! 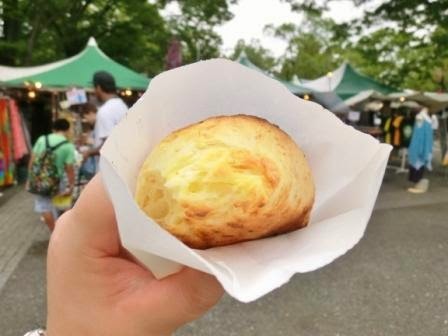 And going to another stand, I bought Pao de queijo, Brazilian cheese roll. They just baked it, so it was so savory! 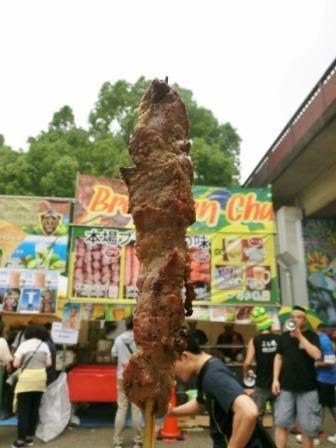 There are also non-food stands. They were selling resort dresses, swimming gears, small accessories, Brazil-related DVDs and FIFA World Cup goods! 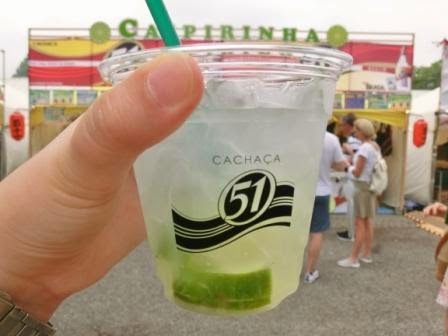 We know FIFA World Cup was a tragedy for Brazil and I was worried about it, but the Festival was all fine and exciting. Of course, a lot of musical and cultural events are held on the stage. This is the opening ceremony of Brazil Festival. The Brazilian ambassador, some Brazilian and Japanese business people, etc, were on the stage. I was a bit dancing with the rhythm. It was a great day and fortunately it didn’t rain. Brazil Festival has been for these some years, so I hope to join next year, too! Yoyogi Park often holds nice events on weekends. I write it when I know, and it is a good idea to visit Harajuku on weekends when you stay in Tokyo. Happy to share my day with you!